Today I'll discuss, I mean re-discuss the Truly Rich Club Big Blessing #8. I remember I already shared this before on a previous Truly Rich Club Review blog entry. 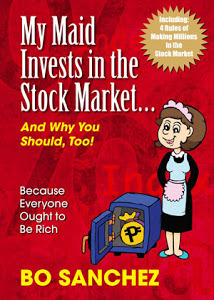 The title is "How To Earn Passive Income Without Quitting Your Job [The Truly Rich Club Way]". Yes, you read it right YOU can earn passive income from the Truly Rich Club too. 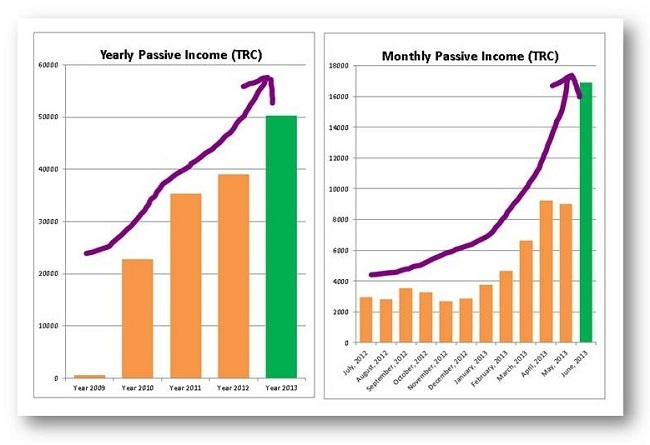 Monthly and regular passive income. How? You can earn passive income by being a Truly Rich Club affiliate. It's automatic, if you become a member, you'll entitled to be an affiliate too. 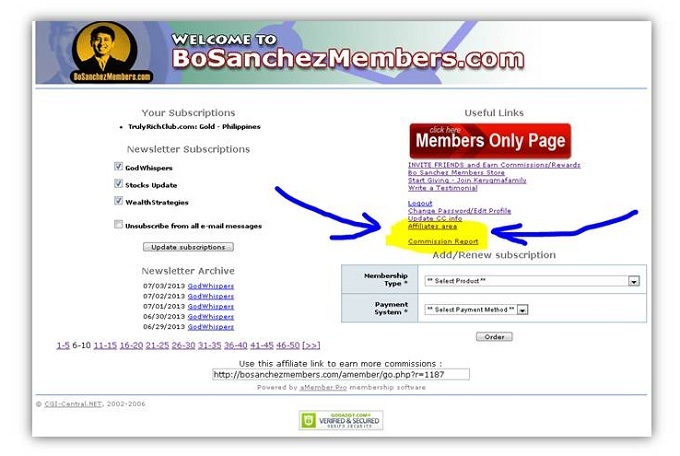 By just promoting Bo Sanchez membership site though your unique affiliate link. "I know this is a huge surprise to you.You never expected to earn from the Club, right?But as long as I’m here, be used to surprises! Because I’ll continue to cook up new ways to bless you. And yes, I figured a way for you to earn money!And it’s passive income: You earn while you sleep. You earn even if you’re vacationing in an island, sipping orange juice atop a hammock.How? You Can Be My Affiliate.Very simple: All you have to do is email your friends and tell them of your great experience in the TrulyRichClub. (Or just put a TrulyRichClub link in your Blog or Facebook account.) For every person that joins the TrulyRichClub because of your invitation, you get 20% of his or her monthly subscription fee every month PLUS a 5% commission for all the subscribers this person gets. So you get 20% on your first line and 5% on your second line. For as long as a person is a member, you’ll receive your commission month after month after month…That’s not all…"
Ops, let me define some terms before I proceed... What are these terms: Affiliate, Affiliate Link, Affiliate Marketing? Here's the best definition I found from my internet marketing glossary. A person who makes money by sending leads to online merchants. merchant through their personal affiliate link, the affiliate is flagged as the source of the traffic so they can be identified and rewarded appropriately. A method of gaining web traffic and sales by rewarding affiliates for sending leads to your website. The reward is usually monetary and is paid when an affiliate sends a lead that takes a desired action such as submitting contact information or, more commonly, making a purchase. Going back. I subscribed on Bro Bo Sanchez' Truly Rich Club year 2009 and been sharing the club since I joined. I been promoting mostly in social media. Yap! in Facebook. I guess my FB friends would find me annoying every time I am posing links in some FB business or marketing groups. But it's ok. It's all good. I am not sharing this for my own, I am sharing Truly Rich Club for them and for you. Let's walk hand-in-hand in the Truly Rich journey. I should have started this blog http://www.trulyrichclubreview.com 2009, the time I joined but no I only started this blog since January of 2013. Let me show you the affiliate system of the Truly Rich Club. Once you subscribed on the Truly Rich Club, you will get an instant access on all the Free Stuff and monthly information from Bo Sanchez and his Team. 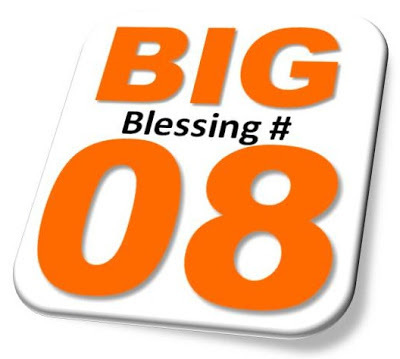 From the site index you can also notice a links related to this Big Blessing #8. The Affiliate Area and the Commission Report. See the sample image below. Bro Bo mentioned that particular feature of the club is really optional. It really is. Investigate first. If you found out that the club is for you then apply all the lessons, later you'll find yourself promoting the Truly Rich Club too. The truth is a lot of members of the club are not aware of the affiliate system inside. In fact one of my friend who join last year don't know that this Truly Rich Club Big Blessing #8 exist. If you want... you can give yourself a try. join the Truly Rich Club and start promoting it to your friends. Try promoting online. Be an affiliate. Don't worry, it has money back guarantee. Try it 1 or 2 months, if you don't like it, email Bro Bo's support team and you can have your money back. But I bet you wouldn't do that. Try it now. When I started promoting Truly Rich Club, my only goal way back then was to get a passive income in a way I can get the Truly Rich Club GOLD for FREE. If that's 20% for every successful sign-ups, then the number of friends I need is only 5. 20% multiply by 5 people is 100%. With that, I can get my monthly subscription 100% FREE. The images below is a sample snap shot of the the affiliate statistics inside the Truly Rich Club. I am sharing this not to brag that I am earning being an affiliate. In fact this earning is not too big as my goal. But why I am sharing you this. I want you to know that it's true. You can earn while you are sleeping. That's the nature of having a regular passive income. This Truly Rich Club Review site goal is to reach more people as much as I can. But I can do so much, that's why I encourage my reader. YOU, to walk with me on this journey to become Truly Rich. You can join the club too and enjoy the ride. Be blessed.